Saturday 6th May saw NADP (National Association of Deafened People) and EFHOH (European Federation of Hard of Hearing) join forces to host the 2017 conference. ALAS and ALS (Association of Lipspeakers) were both present to represent lipspeaking. Just like Deaf Day 2017, both organisations worked together to promote the communication preference. 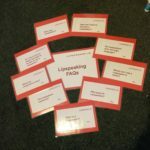 Fiona Walker from ALAS, and Lynne Dubin from ALS were answering lots of questions and using their handy lipspeaking information cards made by Linzi Weatherson.